Cool | You can imagine where it goes from here. 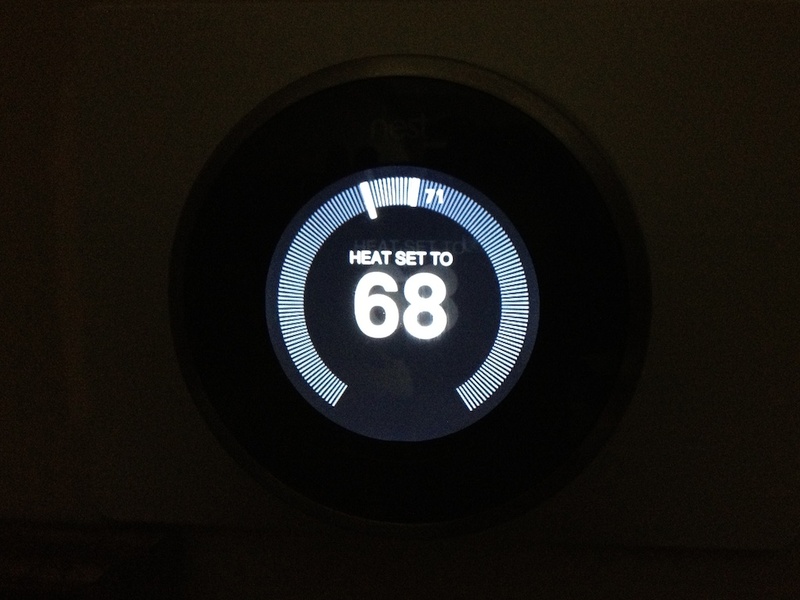 Last year the Nest Learning Thermostat came out and sold out pretty damn quickly. At the time I wasn’t really in a position to purchase one anyway. They recently came back into stock and Nest e-mailed me that it was available to be ordered again. I jumped on it right away. 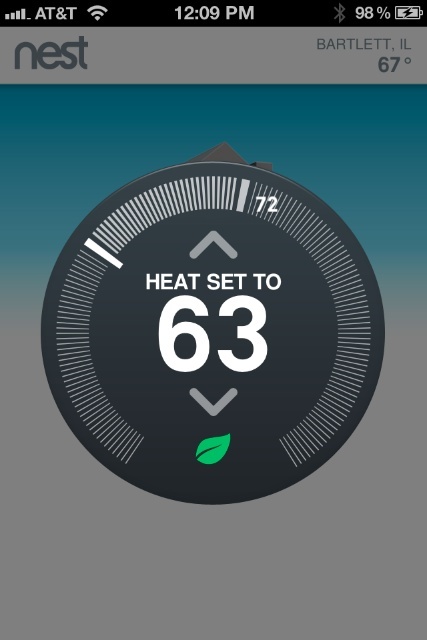 In case you’re not familiar with the Nest: its a thermostat created by some ex-Apple folks that attempts to learn its schedule from you so it can save energy. (Its interesting to note, that most people don’t end up programming their programmable thermostats because its too hard. Most of your standard ones have interfaces not unlike VCR programming. We all know how that went.) Even if you don’t remember to set the thermostat down when you leave, it’ll start to learn when you’re “away” and use its away temperature to build the schedule. The Nest also hooks into your wireless network so you can remotely control your thermostat through their webpage or an app on your mobile device. The wifi also lets it do things like look up the external temperature, so it can use that as a factor into your heading or cooling. Needless to say, I’m excited about such a device. Its weird to be excited by something like a thermostat, but its a thermostat made for today. I had tweeted about my excitement that it was on the way, and had a nice interaction with Nest over twitter where they asked for pictures. That leads to this blog post… I thought I’d take the chance to do an unboxing video, which I’ve never done before, and post some photos of the install of the Nest. Robots in disguise will likely alter your commute for the next few days as filming for the third installment of the Transformers film franchise takes over the Magnificent Mile. Michigan Avenue between Wacker Drive and Ontario Street will close Thursday night and will remain shut down through 5 a.m. on Monday, July 19. But that’s okay, because that’s a pretty cool thing to have the filming of Transformers 3 in town. Even cooler is what’s on Michigan Avenue between Wacker and Ontario: my office. Because I don’t intend to sit in the office all weekend, I’ve set up a web cam pointed down at the street. On Friday I’ll aim it better, but for now, you can watch the traffic on Michigan Ave. I always knew I was taking care of business for the right reasons. Thanks to the scientists behind Stinky farts may help regulate blood pressure for confirming it. I wrote this for work, but I thought I’d repost it here, stripping out some of the work specific stuff. Last Friday July 6th at about 1 I picked up my iPhone. I wanted to give it a serious couple of days of use before I posted about it. We all heard and read about the activation problems in the first 24 hours or so. I’m happy to report that those issues were non-existent when I went to activate. Almost everything you do with the phone starts with iTunes, and activation is no different. I fired up iTunes, plugged the phone into the USB port and just started answering the questions. The activation went very smooth and I was mostly using my phone within 15 minutes of getting back from the Apple store. The snag I had though was in transferring my number from my old carrier. It took them 24 hours to give up the number to AT&T. During that time I could make calls and do network functions like e-mail and web surfing, but I couldn’t receive calls. Once that was done, it went like a shot. Synchronization is also done via iTunes. On my OS X based MacBook Pro, this provides for a very tight integration with tools that Apple ships with OS X. The good side is much like an iPod sync, things just go when you cradle your device. The down side is that you’re tied to using iTunes. If you’re on OS X or Windows this isn’t really an issue. For those on other platforms, this could be a limiting issue. I haven’t tried syncing the phone with Windows so I can’t comment on what you can and cannot do via iTunes on the Windows and how well it integrates other than knowing what tools Apple says is supported on the stats page. The rest of this will really focus on the parts of the phone I really interact with. If I don’t mention an app or don’t really talk about it, I haven’t used it much yet. Via TV Squad. This is brilliant.